If you come into therapy, are you weak? Memories jump to mind of things I’ve fixed myself, and a smile comes to my face, especially if it was something I’d never done before. Doing things yourself makes you feel good. You learn from your mistakes, you enjoy your successes. There are many instances, however, when we choose between doing something ourselves, or using the expertise of someone else. You can file your own divorce, or seek advice from a lawyer. You can prepare a meal, or go to a restaurant. You can organize your own business finances, or find an accountant. You can pray alone, or listen to a pastor’s sermon. What’s so different about mental health? We consult with others for their expertise. We admire when leaders surround themselves with people whose opinions may differ from their own, or whose expertise is valuable. We want them to ask for advice. When it’s given, that leader may or may not follow it. But we admire them for questioning whether or not they have all the answers. What a therapist does is no different. If you’ve ever been to a really good therapist, or talked to someone who has, you’ll find out something different. Yes, therapy involves feelings. And yes, the relationship is supportive. But good therapy is hard work. Whatever the therapist has to offer, whether it’s a specific technique like EMDR, whether it’s a therapeutic mode of treatment, like cognitive-behavioral or emotionally-focused, whether it’s group, couple or individual work – it involves pain and, at times, harsh honesty with yourself. That therapist has experience with mental and emotional pain – and what you can do about it. He or she isn’t there to tell you what to do, take over your life, or solve your problems for you. A therapist is a consultant, a guide. They’ve worked with hundreds of people, just like you. A therapist can offer specific suggestions, recommendations, insights, and healing can come from the therapeutic relationship itself. 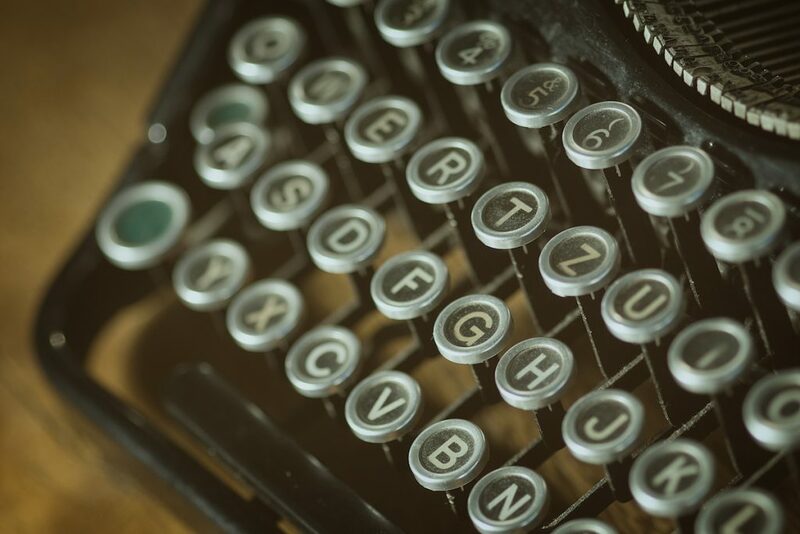 However, the information you give about yourself, about your history — those are the tools that a good therapist has to use to help you make the changes you want to make. Many of the men I’ve seen will tell you it’s the hardest work they’ve ever done. I understand and respect that men are still taught, and many believe, that displaying vulnerability isn’t the thing to do. Men may mock other men for doing so. Women who buy into a male stereotype can have a fear response if their man reveals vulnerability. I’ve written about both genders living out “perfectly hidden depression,” where vulnerability is avoided under the guise of a perfectly wonderful life. The cost can be loneliness, exhaustion, and an endless loop of despair. 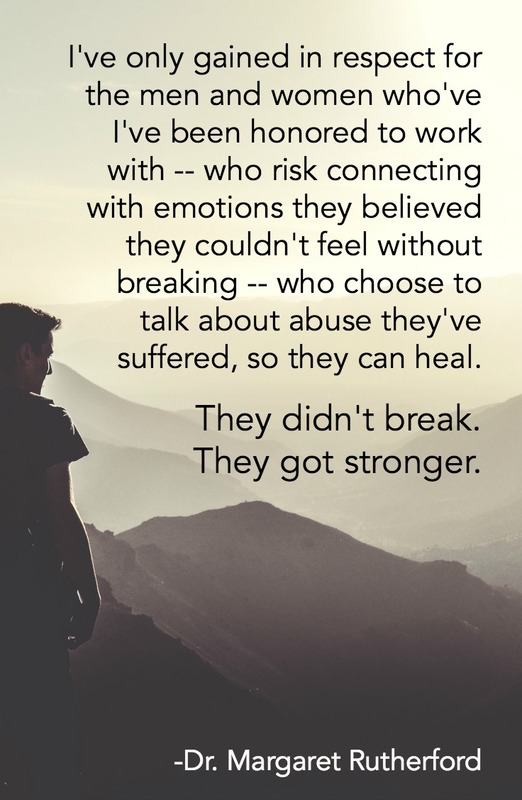 I respect the men and women whom I’ve been honored to work with — who risk connecting with emotions they believed they couldn’t feel without breaking — who choose to talk about abuse or trauma they’ve suffered, so they can heal. They didn’t break. They got stronger. They’ve chosen to stop passing down the myth that anyone has to hide their pain. 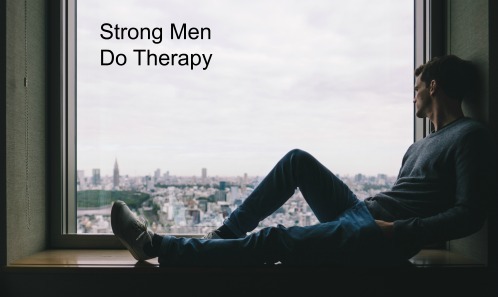 Men are killing themselves in record numbers. The world-wide figures are staggering, and painful to realize. Isn’t it time for healing? 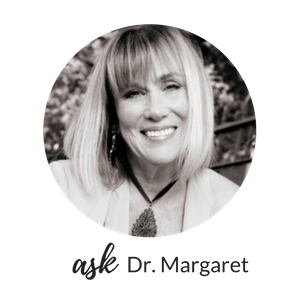 You can now listen to Dr. Margaret as she talks about depression and many other topics on her new podcast, SelfWork with Dr. Margaret Rutherford. Click here!